Night sky portraits are a great way to get started in astrophotography. You can photograph your favorite constelations, even relatively bright comets, and some of the brighter deep sky objects. For example one of my first nights taking some constelation pictures I decided to take one of Cygnus. I was delighted when part of the North America nebula (NGC 700) showed up. Look for a B or Bulb setting. An old SLR camera is perfect for this. Lense with a medium to wide field focal length. 55mm or lower works well for this. Start the exposure by pressing and holding the shutter release button. 30 seconds will capture stars as well as the brighter deep sky objects. Stop the exposure by depressing the button. Cable Shutter Release for the camera capable of locking for hands free operation. You will need your hands for guiding. 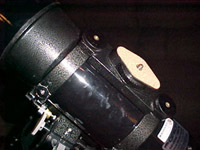 A high magnification eyepiece (8mm or smaller FL). An illuminated reticle eyepiece is highly recomended, and virtually required if you're using a long (100mm or greater) focal length lense on the camera. This is an eyepiece with illuminated crosshairs. Focus: With the camera focused at infinity, or focus on a brigther star (not too bright). Aim: This can be very dificult, it helps to calculate the field of view of your lense compare on a star chart what you will see when the object is centered. Guide: make occasional corrections, for example move the guide star to the center of the eyepiece every 30 seconds or so. When you think you've exposed long enough (or a car is comming and is about to shine right into your lense!) stop the exposure by unlocking the shutter release. 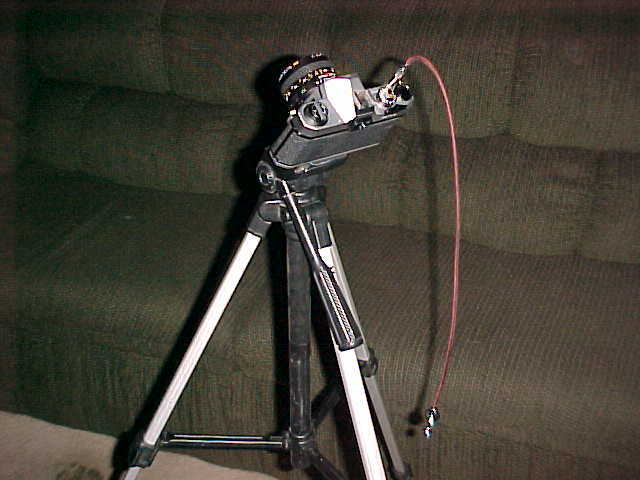 Afocal coupling is the same as holding a camera with lense up to the eyepiece of the telescope. For best results you will want to use a mount. Shown in the picture is Orion's steadypix camera mount connected to my Sony Mavica digital camera through the 1/4" tripod mount and clamped on to a 10mm eyepiece. With afocal coupling it is better to use a digital camera or a web cam than film. If your camera lets you set the ISO, set it to the highest setting in order to achive the shortest exposure time. Make sure your lense is as close to your eyepiece as you can get within reason, taking care not to scratch your lense or filters. 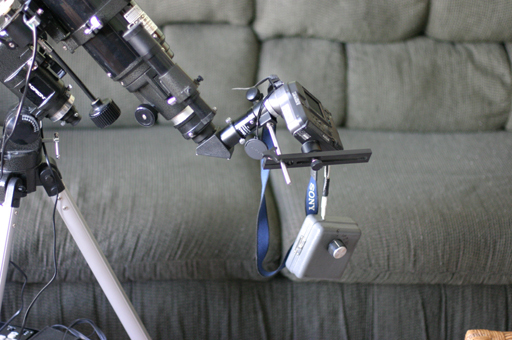 If you are using a camera mount which couples to the eyepiece, allign the eyepiece to the camera before attaching the eyepiece to the telescope. Pointing the camera and the eyepiece at a light source can make it easier to center the eyepice. Once adjusted, make sure the mount is tight enough that under the weight of your camera everything stays in line. 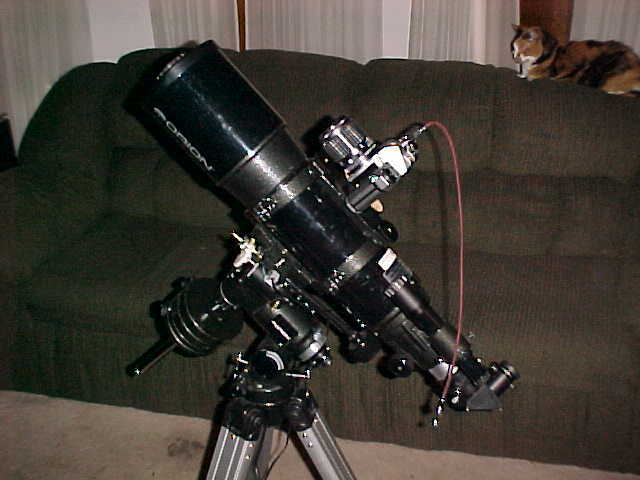 Focusing the telescopoe can be very difficult. Depending on your target, it may be easier to focus on a bright star. Spend a lot of time to make sure you have good focus. Center your target. Depending on the focal length of the lense and eyepieces used, with afocal coupling it is often very important your target remains center of the image. Sometimes there is a blind spot around the edges, or at the very least vignetting. If your camera allows you to control the shutter speed select the one that gives you the most detail. 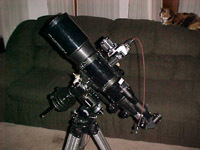 You may want to look up in a chart, or use software such as the Afocal Coupling calculator (Eyepiece Projection Calculator)here. Take as many exposures of your target as you can. As the atmosphere is always moving and blurring your images, the more images you take the more you can stack and correct for this. You can achieve sharper images this way.